Detectors show status as 0/1 (On/Off) and connect the DI inputs to Dry Contact inputs (terminal block). WLD (Water Leak Detection) sensing cable for surface 2D liquid detection. Can be used as detector (relay output) or sensor powered from RJ11 and connected to 1-Wire UNI bus. A correctly installed HWg-WLD cable based water leak detection provides extra time to solve flood problems. The 2D water leak detection can help fix the source of the leak before the costly consequences arise. HWg-WLD detects water leaks or water floods along the entire length of the sensing cable. By placing the cable near possible flood sources, the whole area can be effectively monitored. The “WLD sensing cable” reacts to just a few drops of liquid (water, ethylene glycol, ...) and can be also used to detect condensation. After flooding, the sensing cable can be dried and reused. “WLD sensing cable“ can be easily extended with sensing and non-sensing cable segments to create a cost-effective and robust protection of a 2D area against flooding. As a notable advantage, the “WLD sensing cable” does not produce false alarms when bent, twisted or pinched. 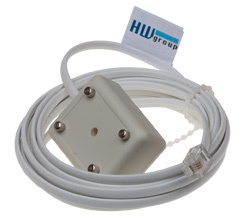 The "HWg-WLD" water leak detector unit can be ordered in a package with a 2m WLD liquid detection cable. Two versions are available – a version powered over the Ethernet (PoE – IEEE 802.3af) or a version with a mains power adapter. HWg-WLD devices can work together with a central SMS gateway to send text messages (SMS), and can be connected to the SensDesk.com online portal or another software monitoring system by HW group. 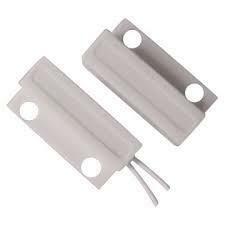 Door contact Open door detector consists of a magnet and a contact (2 parts of equal dimensions). Connection cable: 2 m (white 2-wire cable) Tamper loop is for security loopback only.